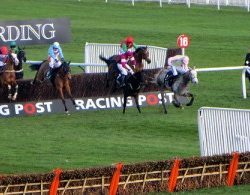 Espoir D’Allen wins the Champion Hurdle at Cheltenham Festival, tips for Day 2 | Compare odds UK, Europe, Premier League and European leagues. A shock result Espoir D’Allen romps home ridden by Mark Walsh at 16 – 1. Buveur D’Air failed to make it 3 wins in a row: LetsCompareBets predicted this result on our Cheltenham Festival betting bonus page. Apple’s Jade failed to dethrone Buveur D’Air, something which was expected by the pundits. Instead of putting a wager on the leading three runners, a simple lay bet on Buveur D’Air would have been the best bet. A lay bet is a bet that a horse will lose. 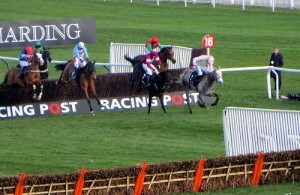 Espoir D’Allen gave trainer Gavin Cromwell his first triumph at Cheltenham Festival. Interestingly both Espoir D’Allen and Buveur D’Air are owned by millionaire JP McManus. The eighth time a JP McManus owned horse has won the race. JP McManus has Champ ridden by Barry Geraghty in this race. At odds of 4.8 on Betfair Champ is favourite to win. Will JP McManus take another winner on Day 2? The 7 year old won the Challow Hurdle last time, but, none of the lasts 16 Challow winners have gone on to win The Ballymore, an interested statistic for anyone looking to fancy Champ. Santini has has taken most of the bets in this race, on Betfair, and is second favourite. Trainer Nicky Henderson has been issuing regular updates on Santini’s stone bruise in the run up to the race. This gives Delta Work and Topofthegame, both on similar odds, the upper hand. Worth a lay bet on Santini and an each way bet on the favourite (Delta Work) and third favourite (Topofthegame). The Coral Cup is used to having long priced winners taking glory. Often with odds of 12/1 or more. A riddle that is difficult to solve and a race for taking a punt. With the shorted odds out of all the races on the day Altior ridden by Nico de Boinville starts the race on an unbeaten record of 18 over jumps. The last time a Champion Chase winner returned to defend their title was Master Minded in 2009. So take from that what you will. Altior’s performance has been remarkable running as well on soft going as good. Last years Grand National Winner Tigor Roll is odds on favourite in the race. Tiger Roll won this race last year in the run up to the Aintree victory. Form looks good with a win last month at Navan. Tiger Roll’s run could give excellent clues as to the horses ability to defend it’s title at the Grand National. On equally good form is Josies Orders and on much better odds. Big priced winners is the name of the game for this race. With six of the last seven winners chalking up odds of 25/1 or more. Band of Outlaws is favourite coming into the race on good form on good and soft ground. Blue Sari and Envoi Allen top the market with similar prices. Willie Mullins, the trainer, has good form at this race with Blue Sari being his only runner. Envoi Allen comes to the race on better form, unbeaten in the last four races and possibly the better bet out of the two. Take a look at the Cheltenham Festival betting bonus page or go to Betfair to get the best fixed odds or betting exchange odds.